What even is a hashtag??? It’s the key to growing your brand's organic growth. Hashtags often get thrown around without purpose, but we are here to tell you that if you use them correctly, it can make or break your social media strategy. By adding a #savvy touch to your social media game, the potential to grow your brand is limitless. Branded hashtags, which are created specifically for your company in mind. Fun fact: 70% of hashtags are branded. You can use these to encourage (and find) user generated content, as well as analyze your efforts. Community hashtags, which are general hashtags that are widely used, and include things like: #tbt, #instafood, #throwback and #ootd. We all live very busy lives, with little time to perfect all the little details. Luckily, for you iPhone lovers, there’s a solution! 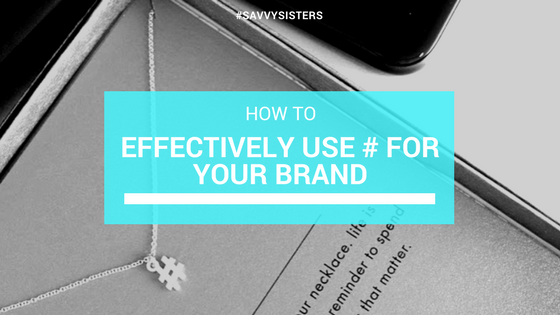 Saving lists of your hashtags will help you know the value of each to determine what works and what doesn’t. Instead of putting the hashtags in the caption, leave a comment immediately after posting. You can use up to 30 hashtags per comment. Focus on the activity of hashtags. It’s important to always do hashtags with a purpose and finding a specific niche audience that will find use in your hashtags. Finding hashtags with more than 1,000 users will get you the most results because you know people are constantly looking for that specific one. Get a general idea of how often people use hashtags. If the hashtags are too popular, your post will be gone in seconds. Hashtags that have a lot of viewage are harder to track and have a lower conversion rate. Use what’s popular instead of what’s trending. Trends come and go, so it’s important to keep a long shelf-life of your branded hashtags. #’s For Your Business Hashtags are both keywords and conversations. Instagram users can now search for a location or hashtag, and see a Story compiled from Story posts by other users that include that location sticker, hashtag sticker, or hashtag in the caption. Location Stories from nearby places (but not Hashtag Stories) will also appear featured on the Explore tab. According to Simply Measured, using even a single # increases post engagement by 12.6 percent. Hashtags are an effective way to drive organic traffic to your content. The more specific the hashtags the better. Add new hashtags to target and leverage the social authority towards organic authority. Different #’s can mean different things to many people. All in all, hashtags are a powerful tool that are often overlooked. Hashtags are crucial to growing your brand organically. If you’d like to learn more about how you can grow your brand sign up for one of our social media training sessions, and learn how you can take your brand to the next level.